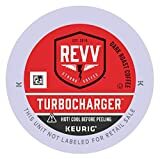 Revv Coffee Pods are made for use in Keurig style coffee brewers. 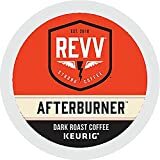 Revv Coffee Pods contain about 27% more caffeine than standard coffee pods. Green Mountain Coffee which is the company who owns Keurig states that K-cups have 75-125 mg of caffeine per pod. Therefore, Revv Coffee pods would contain 95-159 mg of caffeine with a median amount of 127 mg.
How Does Revv Coffee Pods Compare? 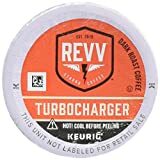 Revv Coffee Pods contains 15.88 mgs of caffeine per fluid ounce (53.68mg/100 ml).